President Muhammadu Buhari has congratulated Nigeria’s team for an outstanding performance at the Paralympic games in Rio, Brazil. While the able-body Nigeria Team only got one bronze medal at the Rio Olympics, the paralympic team won twelve medals including eight gold medals. 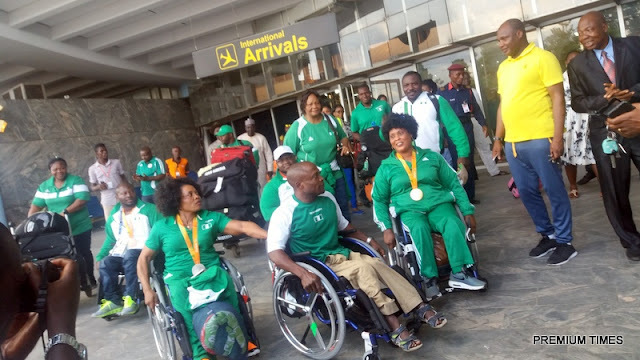 The President in a statement by the Senior Special Assistant on Media and Publicity, Garba Shehu, joined all sports-loving Nigerians in commending the paralympic athletes for doing the country proud. He noted that by winning 12 medals and setting new records, they became the top-performing African team at the 2016 games. He extolled the resilient spirit of the Nigerian Paralympic athletes, who were able to excel in the face of adversity. The President also applauded the athletes for their tenacity, focus and determination, which he said has brought glory to the country. He extended gratitude to all the officials and trainers of the Paralympic athletes, who made sacrifices and persevered to fly the country’s colours.